Today Marvel Comics announced that comic fans across the globe can now purchase its classic graphic novels via the iBooks app. “With an iPad, iPhone, or iPod touch, Marvel fans across the world can now purchase over 80 graphic novels with fan-favorite characters like Thor, Captain America, Iron Man, Hulk, Wolverine, Spider-Man and more by launching the iBooks app”. Fans can visit the dedicated section for Marvel Comics on the iTunes Store to begin downloading the iconic Marvel’s novels today. The prices currently vary from free to $24.99. The Marvel promises to add new titles to the offering each week. Furthermore, “New Avengers Vol. 1: Breakout" can be downloaded at no charge for a limited period of time. The company also offers literary-adapted novels for adults (“Pride & Prejudice“) and children (“Wonderful Wizard of Oz“). It worth saying that the Walt Disney Company acquired Marvel Entertainment in 2009 for more than 4$ billion and Steve Jobs sit on Disney’s board of directors until August of 2011. 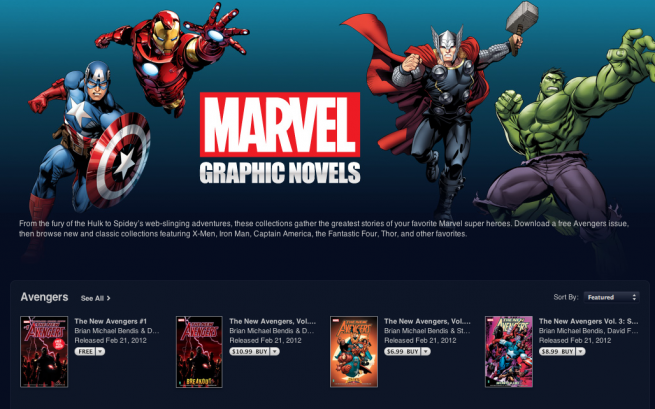 Most of the graphic novels require iOS 4.2 or later and iBooks 1.2 or later. They can be viewed through the iBooks app on an iPhone (3G or later), iPad or on the iPod touch (second generation model or later).